There is something inherently photogenic about kushti, an ancient form of wrestling practiced in India. For more than 2,000 years, men known as pehlwans (wrestlers) have trained assiduously in the sport, rising at dawn to stretch and fight under the guidance of a Hindu guru, or Muslim ustad. It's a scene any magazine editor would appreciate -- from the bright scraps of cloth that make up a pehlwan's traditional uniform, to the mud floor that coats every limb in sight by the session's end. A pehlwan performs his daily training at dawn at his local gym, along the Ganges River in Varanasi. Copyright Laurent Goldstein. Pritviraj, a pehlwan who trains at the same gym, rests at sunrise. Copyright Laurent Goldstein. That innate visual drama was not lost on Laurent Goldstein, a photographer based in Varanasi, India. 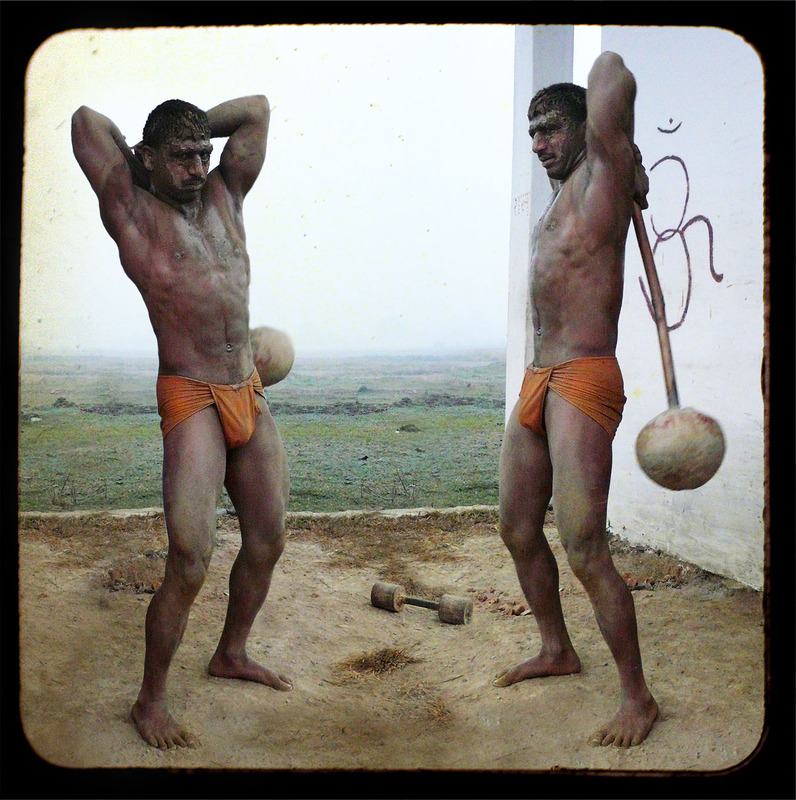 One early morning, Goldstein visited an akhara, or gymnasium, to take candid shots of the pehlwans doing their thing. The light was a photographer's dream, "reflecting in the holy waters and bringing vivid colors to the walls of the wrestling grounds," Goldstein writes on his Flickr page. Pritviraj and another pehlwan, Vinod, after a round of strenuous training. Pritvitraj, who Goldstein describes as "the local champion," stands in a classic position. Copyright Laurent Goldstein. Even though this photography work was candid, spontaneous and improvised, there is a fallacy of composition because those men were not aware of the sensuality nor the ambiguity which is arising in this series of pictures. This is why it is important to mention that all those images are absolutely innocent and that it is all about a kind of martial art which remains important in the Indian culture. When he isn't training, Vinod operates a shop down the ghat from where the gym is, where he sells tea, water, sweets, and the Indian delicacy known as paan, according to Goldstein. Copyright Laurent Goldstein. A close-up of a pehlwan mid-training. Copyright Laurent Goldstein. That accidental sensuality is fading as India modernizes. 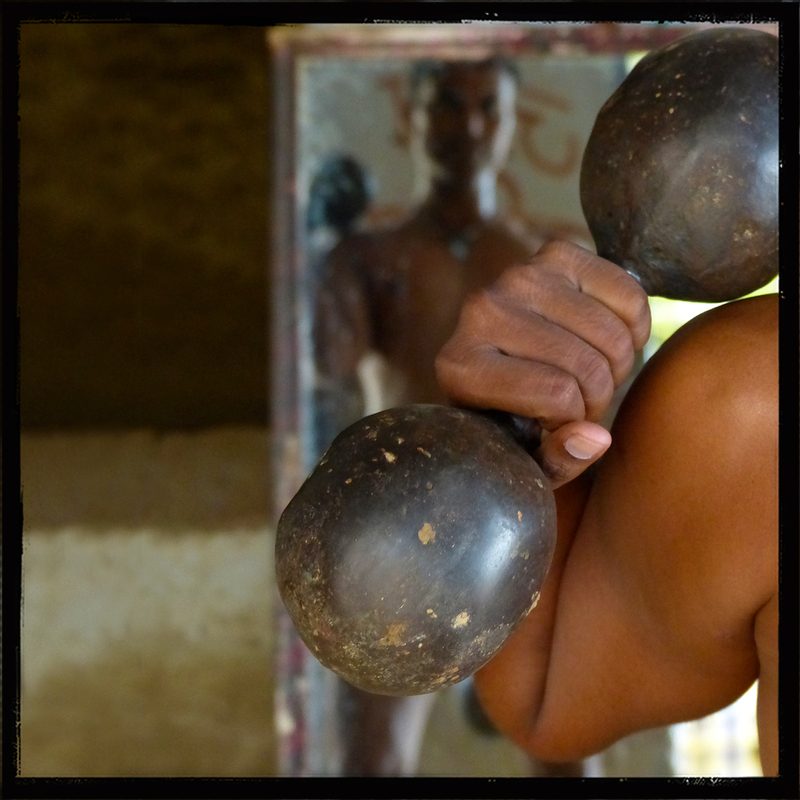 In urban centers like Bombay, kushti is losing support, and so the sport is changing to keep up with the times. "In place of earthen pits," reported The New York Times this month, "emphasis has shifted to training and competing on foam mats, wearing spandex uniforms, donning rubber wrestling shoes and adopting a format of time limits for each bout, all to familiarize competitors with the international styles of wrestling." Ironically, this shift is all about visuals. Kushti is competing with "TV-friendly" sports like cricket, "whose fast action makes it ideal for broadcasts," reports the Times. And so the old methods are going. The first pehlwan Goldstein sighted upon entering a second akhara, which he writes is "lost in the fields" near the village of Sakalhida, in the state of Uttar Pradesh. Copyright Laurent Goldstein. Two pehlwans hoist "gadas," training devices comprised of large round rocks attached to meter-long bamboo staffs. Writes Goldstein: "It may weigh as little as five [kilograms, or 11 pounds] or as much as fifty to sixty kilograms [from 110 to 132 pounds]." Copyright Laurent Goldstein. So too is the rigorous lifestyle. Increasingly, Indian men are joining akharas the way Americans join gyms, simply to keep fit. Rather than shape their lives around dungals, or competitions, they train "whenever they are free from work," Goldstein writes. Joseph S. Alter, a professor of anthropology at the University of Pittsburgh who spoke to the Times, called the shift a consequence of a fight between two "fantasies of the imagination." In opposite corners are India's ideal men: the pehlwan, with his "grounded, textured, ethically encompassing masculinity." And facing him, the new male archetype: the "Bollywood hero," who gains strength from the "consumer-oriented desire for very superficial kinds of things." Another image from Sakalhida. Copyright Laurent Goldstein. Pehlwans pose with their gurus outside the akhara in Sakalhida. Their "stiff" appearance is a hallmark of a certain kind of Indian portrait. Writes Goldstein, "it often happens that people strike this pose whenever they think I want to make an 'official' picture. The struggle to stay relevant is a serious topic in the pehlwan community. In the words of the legendary kushti guru and former Olympian, Ganpatrao Andhalkar, to live in the old way is to perform "a kind of invisible tapasya," a reference to the Sanskrit concept of denying oneself pleasure to reach enlightenment.